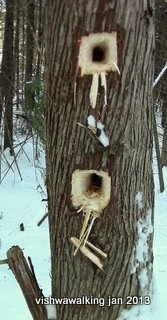 Along the Heritage Trail: huge pileated woodpecker holes. I'm sure the tree is hurting. Watch out for a number of these on the trails. The area is north of Highway #7 and west of Madoc. From Madoc it's 6 kilometres to O'Hara Mill. From downtown Madoc drive a kilometre to Highways #7 and #62. Continue north from there another 1.7 kilometres to to Mill Road (Riggs Road will be on your right). Turn left (west) on Mill Road and travel another 3.2 kilometres to the gate of the park. You'll cross O'Hara Road and Johnson Road on this leg. The Visitor Centre. 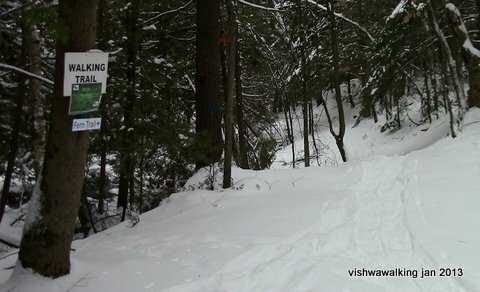 Most of the trails can be accessed just to the right of the centre. Google maps/Google earth, etc., by the way, are pretty useless for O'Hara Mill. They're dated and don't show the trails or even a decent outline of the pond and parking lot. This conservation area has some fine walks, all near O'Hara Pond and the recreated homestead area. Several years ago, the area offered only a short walk. Since 2011 a number of trails have been created. There are now roughly 4.6 kilometres of trails here. You can do them all in an afternoon. The trails criss-cross and there are some shortcuts on the Heritage Trail that can be confusing, but generally the trails are well marked. They are colour coded. 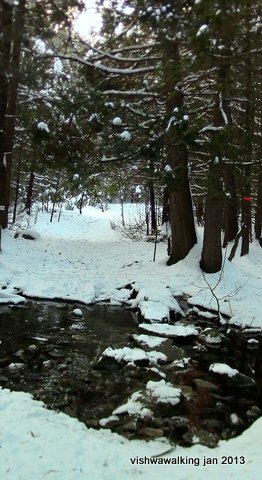 When I walked the park in January 2013, there were no skiers and few walkers, despite perfect snow conditions. The trails seemed underused. In winter, the gates to the area are closed, so you must park your car on Mill Road by the gates. In summer, when the gates are open, you can park in the lot about 100 metres from the road, near the pond. 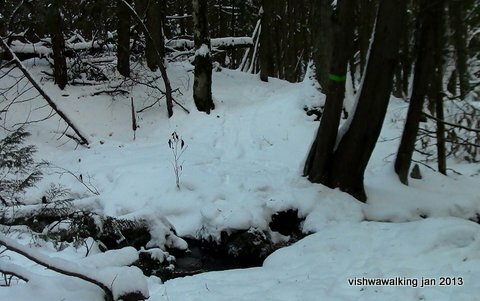 In winter, there is a tobagganing hill near the pond, which gets a good bit of use if the snow cooperates. In 2013, part of the pond was cleared for skating. Overall, a great family place. Geocaching: there are, apparently six geocaches in the conservation area according to information on the the "friends" site (see link below). Check out the map at the parking lot to get your bearings, then walk another 165 metres along the edge of the pond to the bridge. You can walk over the bridge and head right into the little meadow where you can have a look at the mini pioneer village. If you go to the top of the hill, you can pick up a hiking trail map at the visitor centre; there's a box with pamphlets available if the centre is closed. 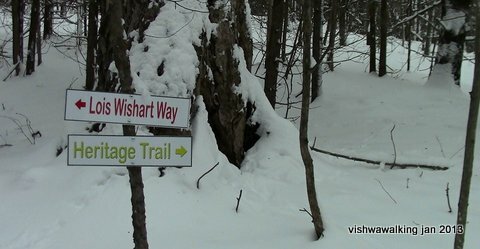 Walk to the left of the centre and you will find the start of the Lois Wishert Way, which manages to cross almost every trail in the park. If you've walked across the bridge and are at the Visitor Centre, take this route. However, a nice start to any walk is to the right of the lower bridge (before you cross it). This is Fern Trail. This pleasant little pathway takes you from the parking lot to the mill bridges. You can get to the bridges by taking the 140 metre shortcut off to the right just inside the gates and through the wood fence to the bridges, thus missing the pathway. However, it's more fun to walk the 100 metres to the parking lot and then veer right to the pathway. Rating: very pleasant, but too short to be rated as a walk in itself. Very easy. This short trail, starts at the lower mill bridge. It initially runs beside Deer Creek and ends at the back road to the buildings. You can then take an easy and open walk walk over the bridge, into the meadow and up to the visitor centre (another 160 metres) to get to the other trails, or loop back through the meadow and over the bridge for a short walk back to the start of this trail. The start of the Fern Trail, just to the left of the lower bridge. Rating: Too short to rate. This is a great stretch if you're nearby and have very limited time or if you just want to get away from some activity at the Homestead. It's also the best way way to start a longer walk on other trails. Easy. 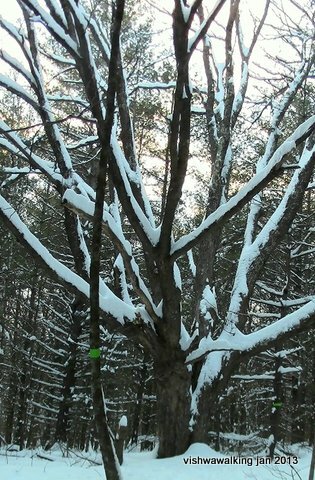 This is an "interpretive" trail — meaning that there are signs along the way pointing out the various kinds of trees. Many of the trails intersect with this trail, so it's the best one to try first to get your bearings. Start at either end. If you start in the parking lot, walk up the hill just beyond the pond and turn right. 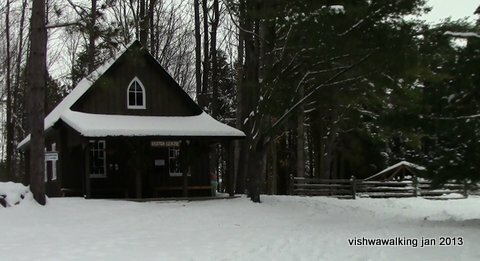 I started to the left of the Visitor centre and made a left at the clearly marked "T" intersection, where the Heritage Trail goes off to the right. There are two creek crossings on this trail. The first, roughly 290 metres from the start, is very easy with strategically placed stepping stones. I would guess that it is crossable (with proper footware) even in high water times. About 440 metres along the way, the trail crosses Deer Creek. This one could be more difficult in high water times. In winter, the fast-flowing (but shallow) water runs under ice that could be hard to read at times. In January, with a little care and walking poles, this one was fine. The trail winds through the woods and around the mill pond. The trail was little used in January when I walked it, except at the hill at the end of the walk. There was lots of toboggan/sleigh activity at this point: kids on the hill with endless energy accompanied by parents who had burned out some time ago and were now shivering by the picnic tables. The first creek crossing for the Lois Wishart Way. This is a fine trail with some good ups and downs and a few choices if you want to shorten the walk by taking the shortcuts — or to lengthen it by leaving it at the Woodland Trail point. If you do this you have lots of options. One might be to take the outermost trails in the park: From the Louis Wishart at the Visitor Centre to the Heritage Trail to the Woodland Trail to the McEachern Train (go right), to loop back to the L. Wishart Way. Go right to get back to the parking lot. Presto! A fine loop with no backtracking. The start of the Heritage Trail, not far back from the Visitor Centre. The Heritage Trail can be slightly confusing as the the shortcuts can throw you. The brochure map is also slightly off. Basically, shortly after the start, avoid the first left, but be on the lookout for the second left. If you miss it, no worries, it's just a little loop. Watch out for a huge fallen tree; keep to its left. If you have to walk through an "alleyway" between the fallen tree and its stump, you're on the loop. Just curve back and you'll find the main trail. If you don't curve back and follow the rail fence, it will take you out to Johnson Road, which could be a possible back door to the trail. You can make this a shorter loop than the one mentioned above by turning right when you get back to the L. Wishart Way and curving back along Creekside Trail (pondside) back to the bridge. This is a great walk with varied trees: lots of coniferous trees, but some fine old hardwoods, sometimes in what seems like "streaks" amid the softwood. A big old tree on the Woodland Trail. There's one tiny creek crossing near the start of the Woodland Trail that should not pose a problem. Again, like most of the trails, the best option for the Woodland Trail is to mix and match to make a loop trail of a comfortable length. A fun trail that runs mostly beside a big swamp full of dead trees. To travel it from the start, cross the covered bridge and bear left along the shore of the pond. At the end of the pond, you'll meet the L. Wishart trail. Bear left here to cross the creek (you can see a picture of the crossing in my L. Wishart Way description), then right again to follow the edge of the marsh. The trail meets with the Woodland Trail, so agian you can figure out a loop that suits you. This is the area's longest trail. I describe it from it's eastern point, right off the L. Wishart Way, going northward then curving west and returning southward to reconnect with the L. Wishart Way. 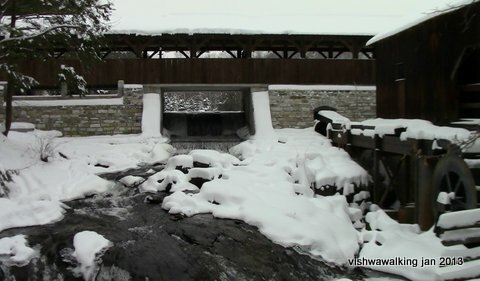 At about the 540 metre point, it crosses Deer Creek at what the volunteer's trail map describes as a "stone bridge." The bridge is long gone, so the crossing might be precarious for some. There are a couple of spots on these trails that would benefit from bridges. The volunteer organization that manages the area is planning to build necessary bridges — make a donation to help them get closer to their goal. Be careful of crusts of ice here that look solid but aren't! The water at the bridge is shallow. Unless you really step astray, the worst you can get is a "soaker." crusts of ice in the winter offering false support. The creek is a really pretty area. Step down the Deer creek Trail a bit (off to the left) and marvel at the water coursing under the trees. When you reconnect with the L. Wishart Trail, turn right and head up the hill and around the pond to get back to the parking lot. A beautiful little stretch of trail along the creek. I describe it from north to south. The creek is sometimes a meandering brook and sometimes a larger marshy expanse. At one point you'll cross the L. Wishart Way. You can head right over the creek here if you want and then curve around the pond on the L. Wishart Way back to the parking lot. Stick to the trail and you'll walk out onto the northern point of the pond. As you get to the pond, walk out to the little point and then loop back across the trail and head eastward to connect with the Creekside Trail. There's a little bridge just before the Creekside Trail; I'm not sure what is underfoot in summer in the marshy bit, but it was very solid in January. By the way, the map shows that this trail reconnects with the L. Wishart Way. Perhaps there is a summer trail that curves a bit more northward, but the winter trail (across the little bridge) links with the Creekside Trail that can then take you back to the main covered bridge.